Roulette is one of the most ancient casino games loved by everyone, especially celebrities and riches. This game can now be enjoyed with American Roulette variant online at the convenience of your home. This version is played on the American table with numbers from 1 to 36 and two zero positions; the single zero and the double zeros. You will find an attractive graphics with a spin wheel at the centre and the betting table in front of it. The game also displays the hot and cold positions on the wheel to help you apply the efficient strategy. The betting limits start from £1 and maximum is £500. This range makes the game ideal for both high and low rollers. This wonderful version of the roulette game was developed by NetEnt, a world leader in online casino gaming. With over 20 years of experience creating hundreds of games and skills in various game technologies, they have managed to place themselves among world’s top five developers. American Roulette is played with numbers from 1 to 36 and two zero positions. The numbers are placed on alternate red and black pockets on the wheel while the zeros are placed in green pockets. The betting limit for each position varies and you can get that info when you roll your mouse over each position on the table. The highest winning position is a straight-up single number that pays 35 to 1 on your bet. Split, street, corner, top line and six line are the other inside bets. The pay here is 17, 11, 8, 6 and 5 times on your bet respectively. Outside Betting: The position outside the wheel where you can bet are red, black, odd, even, low (1-18) and high (19-36). The pay here is one to one on your bet. There are two more outside bets; column and dozen, each with 12 number positions. These two pay two to one if the ball lands on the numbers in these positions. Game Stats: The hot and cold >in the top right corner of American Roulette display the high and low probability number positions. The advanced stats show the wheel graph that highlights stronger inside and outside positions. You can even place your chips directly on the graph and spin the wheel. 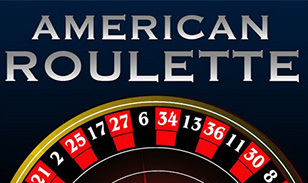 American Roulette is a game with high-quality graphics and sounds that imitate the real world casino. With plenty of exciting options, winning in this game is very easy too>.